Woodwork is one of my two favorite football bars in NYC (more on the football bar aspects here). To be clear: “football” here means the sport that is huge everywhere in the world except the USA (see Glossary). 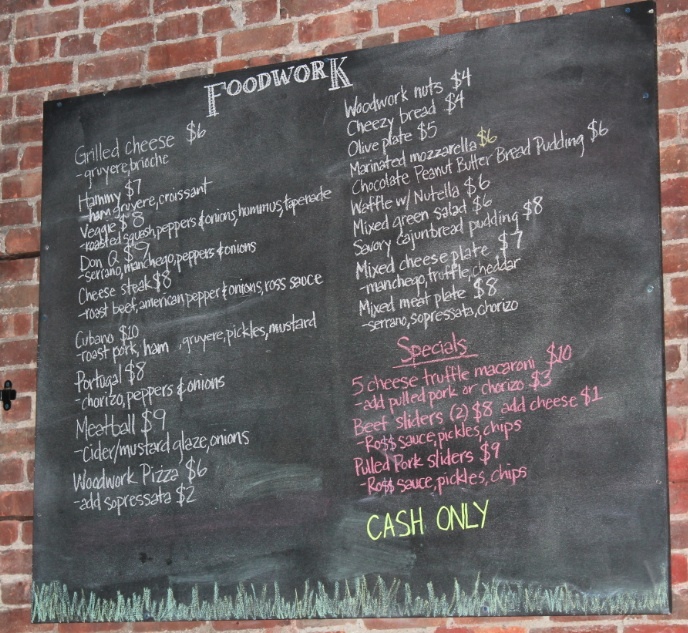 Woodwork boasts a friendly neighborhood crowd and cheap beer and eats. And, the beer selection is pretty impressive. One small downside: it’s an Arsenal bar and I’m a Liverpool supporter. But that’s ok – Husband is an Arsenal fan and it makes him happy. Also, it’s cash only (so visit the ATM before you go). The food offerings are somewhat limited (they don’t have a full restaurant kitchen), though more expansive than you find at most bars. 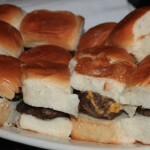 Included in this array are beef and pork sliders, which are both excellent. Today’s focus: the beef variety. You get two in a serving and, really, that’s plenty as they’re thick and full-flavored. You can have them with cheese, but the savory seasoning blend (which tasted like some combination of pepper, Lawry’s seasoning salt and paprika) is sufficiently intense that it actually overwhelmed the cheese to an extent – so why add the fat? 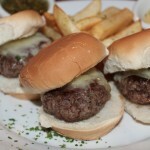 The first time I had these they came with English mustard, which was a nice complement. The second time the mustard was missing, but there was a side of what seemed to be a thinner, more vinegary version of barbeque sauce. On the side were some very tasty barbeque potato chips. I have no idea if these are homemade or come from a bag. I can’t imagine how they’d do them in-house given their equipment, but they don’t have a mass-produced taste or texture. Either way, they were a nice accompaniment. BTW: one of my football buddies tells me that the mac and cheese is fantastic as well. Will have to sample it on a future visit…..
Price: $8.00 (add $1.00 for cheese). 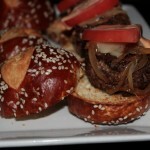 Destination Burger: No – come for the sports and the beer. 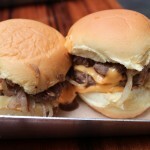 But don’t miss the sliders if you happen to be here. Optional French Fry Rating: No fries but tasty potato chips on the side. Fat and Calorie Worthy: Surely. Today’s Weigh In: +1 lb. This is actually a relief – I have been visiting London these past 10 days (more on that in future posts), and have engaged in such a food and booze tear that I was certain I picked up 5 lbs. So, really, this is like losing 4 lbs. Innit? Hi, I enjoy looking at your article write-up, I wanted to write down a little comment to compliment you and wish a good continuationAll the best for all you blogging efforts.